Hello, everyone. 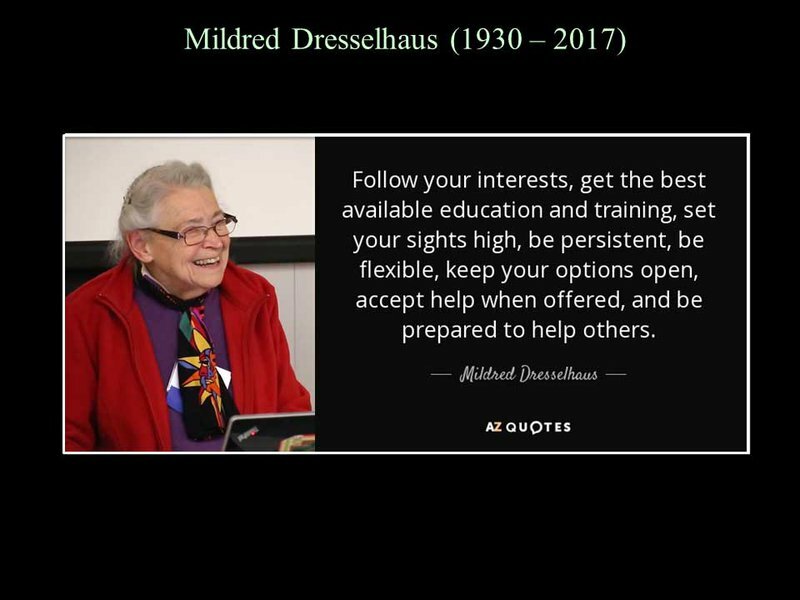 Welcome to this third session of this special MRS day honoring Millie Dresselhaus for her lifelong contribution to and impact on materials research. 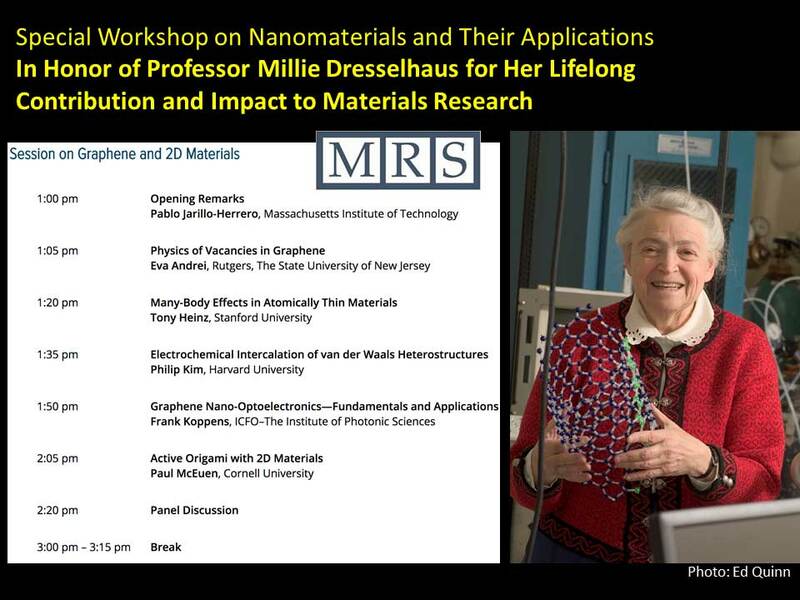 This session is going to be on graphene and 2D materials. I’m Pablo Jarillo-Herrero from MIT. I’m a colleague of Millie's. In this session, we're going to hear from Eva Andrei, Tony Heinz, Philip Kim, Frank Koppens and Paul McEuen. They’re each going to give a short 15-minute talk focused on research. 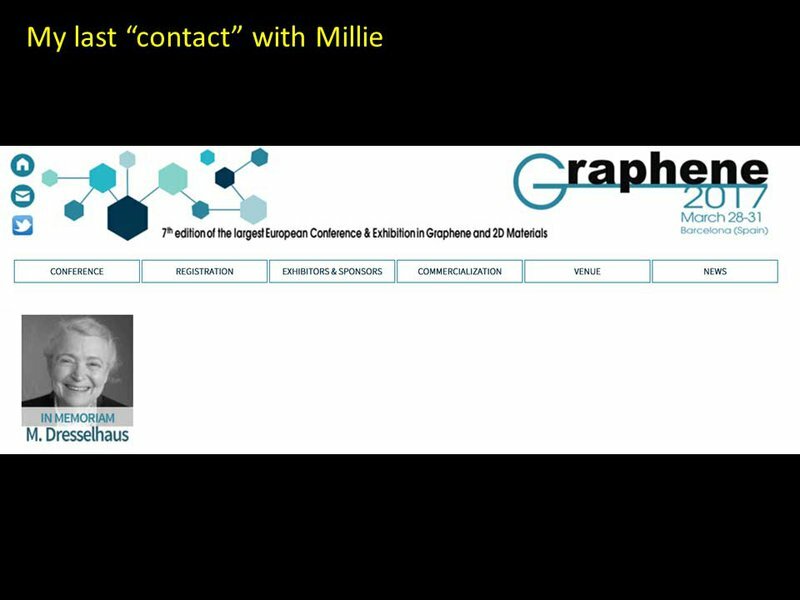 And, after that, we will have a panel discussion, during which we will welcome questions from the audience and have some discussion, and the panelists will offer their thoughts both on the impact that Millie had on their own careers and on how they see the future of graphene and 2D materials. Now, since I’m making the opening remarks but don't get to talk, I’ll just say a few words about Millie. Millie, as you all know, did pioneering work on graphene and carbon nanotubes. 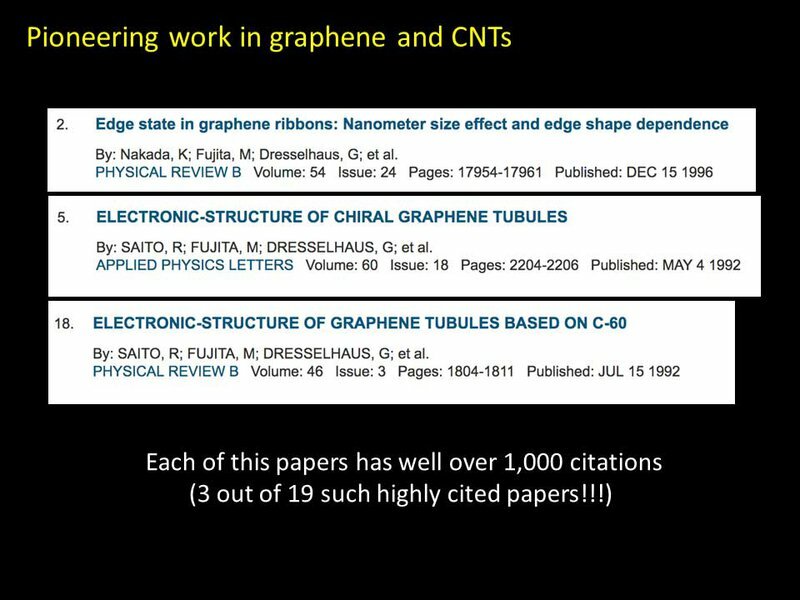 I just want to show, here, these are three of the papers that Millie is most well-known for, and they have to do with either graphene tubules, carbon nanotubes, or graphene nanoribbons. If you’re curious, the numbers, here, are taken from Web of Science. This is number two, number five, and number 18 in her most cited papers. Now, each of these have well over a thousand citations; in fact, this one has over 2,000 citations. These are three out of 19 papers with more than a thousand citations that she has. This is just to give you a brief bibliometric view of the impact that Millie had in the field, and many of the other papers are also related to graphene and carbon nanotubes. Now, I have to say that my first contact with Millie was not a real physical contact. It was through her book, The Science of Fullerenes and Carbon Nanotubes. I had this copy, when I was a grad student, in my office. Everybody had a copy of this book. And I learned a lot from this book. I think I even dared, once, to send an email to Millie but I didn't realize, back then, how busy she was, so I thought, “Maybe she’ll reply to my question about this thing in the book.” But I never dreamed that, many years later, I would become Millie's colleague. 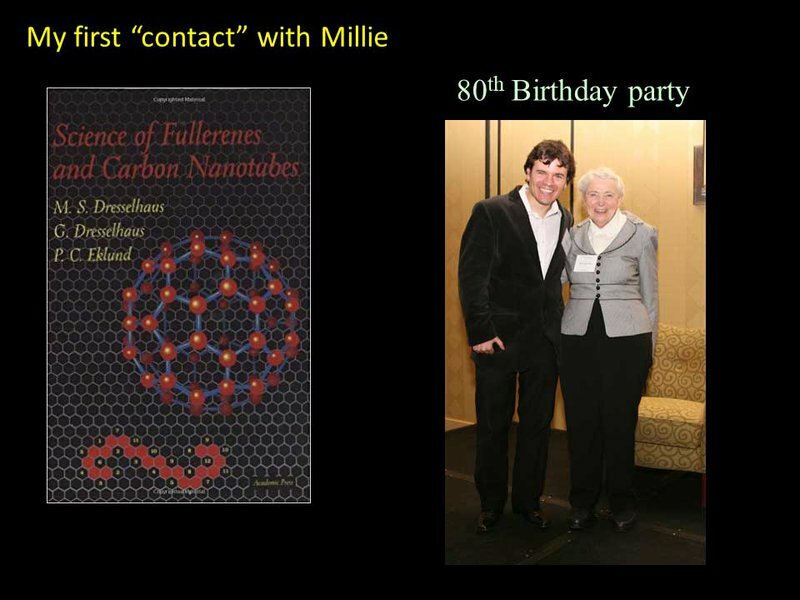 This is a picture of Millie and me at her 80th birthday party at MIT. In fact, her office was just above my office, which was good. I was always hoping whatever thing Millie dropped from up there, I was hoping to catch it — inspiration, thoughts, anything, I was always ready to pick up whatever Millie let go. It would have been an honor to travel with Millie. I was looking forward to chatting. It's a long flight, so I knew we would have plenty of opportunities to chat. But, since she passed away, we couldn't do it. However, I do feel that, in spirit, she was there with us. And this really exemplifies Millie, because she did all of these things. It was the advice she always gave to young people like me, back when I was young, and that’s why I pass it on to you. I think plenty of you were at MIT, yesterday, where lots of people had the opportunity to share many, many moments they shared with Millie and now treasure in their memories. I see many of you are colleagues and former students of Millie. So I welcome you all here, today. Now, we’re going to do something that I believe Millie would like us to do, which is to focus on the science — specifically, on recent and exciting science! In that vein, we have a very distinguished set of speakers that are going to enlighten us on recent and exciting discoveries, and also share with us their memories of Millie. Please help me to welcome the speakers.